I’m not sure about this small-scale, personal film. Director Kim So Yong (b. 1968) left South Korea for the US when she was 12 and this film is her second feature as a Korean-American returning to the country of her birth. Funded by grants from Sundance, Cannes and Pusan Festivals, it feels like an ‘outside’ or observer’s view of something she experienced as a child in some way. The story is very simple. Six year-old Jin and her younger sister Bin find themselves ‘parked’ by their mother, first with their ‘Big Aunt’ and then with their grandparents while mother searches for their father (who has presumably deserted the family). Eventually, it becomes clear that Mother isn’t going to return – at least not in the near future. The children (without previous experience) are very good and the slight story isn’t really a drawback as they are always interesting and engaging. The press notes (from the production company website) reveal that the 89 minute film required 40 hours of footage (shot on Super 16) and that the hardest part was editing out the director’s instructions to the girls. The big problem for me was the shot size and framings. Many shots were in close-up with shallow focus and little in the way of establishing shots. Consequently, I found much of the opening half hour very wearing. Nick suggested that long lenses were being used so that the children would be less bothered by the camera, which makes sense. 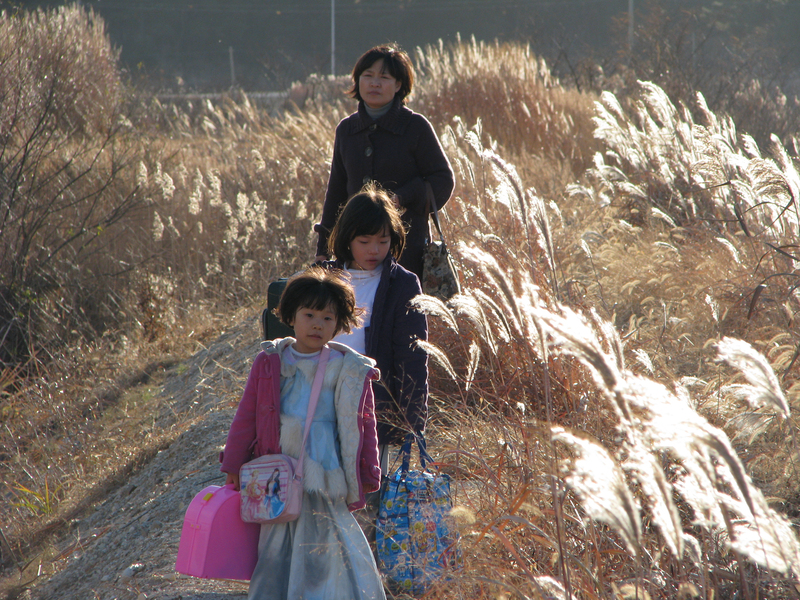 In the later stages of the film, as the children move out of Seoul into first a small town and then a rural area, there are more long shots and more sense of freedom. Perhaps this reflects, in the final sequence at least, a growing confidence as the children feel more secure. If it wasn’t for the camera style, I might have seen the film as a rather austere neo-realist document, which besides the children’s emerging personalities also gave some insights into Korean culture – there is a lot of eating, for instance. This partly signifies the move from city to country (the food was more attractive for me, the more natural/less sophisticated it got) – a contra-flow for the adults who leave the country for the city in many societies. The obvious point to make about the film is that men are peripheral and this is largely a film about mothers, surrogate mothers and small daughters. I’m not sure about the title, but a posting on IMDB suggests that the children represent a mountain and the missing parents are the trees. There does indeed appear to be a symbolic moment when the younger child finds a branch from a tree and ‘plants’ it in a mound of rubble. The film has been very well-reviewed and thinking back there is probably more to it than I first thought. I was aware of reflecting on depictions of childhood in other films. In the image above, the children seem to be moving through a field of similar flowering grasses as in the famous sequence from Satyajit Ray’s Pather Panchali and the hungry children’s search for food reminded me of Rossellini’s Germany Year Zero. Kim’s style, according to Screen International involves deploying “mainly a hand-held camera, close-ups of female faces, and interspersed inserts of static natural settings”. The static shots were very welcome, but what would have pleased me (i.e. a few more long shots instead of CUs) might have produced something too lyrical? This entry was posted in American Independents, Films by women, Korean Cinema. Bookmark the permalink. In a fairly empty cinema, I loved Treeless Mountain – and felt its alternative approach to cinematography worked for me although I agree it may well have been a necessary, directorial decision. The film worked being shot at the level of the children to engage me directly into Jin’s inner world right from the start – her quiet resentment and anxiety were conveyed wordlessly by the intense close-ups on her expression. The longer shots of the children running together through the streets were the points where the audience pulled back to look at them observationally. My emotional response was engaged throughout – and I don’t think that’s a mean feat since the scenes were relatively episodic and there was no non-diegetic music. The consistency comes in our involvement with the children and our sharing of their perspective and anxiety as they encounter each new relative/half relative. In fact, the film seems to manage to split our perspective. As adults, we can recognise that ‘Big Aunt’, who could easily have been played as a villain, is simply a little rough , sorry for herself and her lot – not vicious. The adults behaviour was always understandable if insensitive. This parallel perspective is maintained effectively and is encapsulated in he almost ‘split screen’ style of the shot where the children wait outside the farmhouse whilst Big Aunt and grandpa argue over who is to blame and who should be stuck with them. We are in both places emotionally and is just one great example where simple framing was used to convey the feeling in the story. I thought the cinematography (in the use of colour, lighting) was cleverly restrained. Only at the end is the countryside really russet and luxuriant, whilst the shots of empty places interspersed throughout (like an Ozu pillow shot?) were relatively flat and realistic. The blue princess dress was just a wonderful constume on Bin, who was less of the sensitive princess and more the pragmatist (especially where biscuits or smoked grasshoppers were on offer). I thought So Yong Kim rang a bell – she and her earlier film In Between Days were referenced in an interesting article by Amy Taubin on the phenomenon that is ‘mumblecore’ (emerged out of the SXSW festival in Austin, Texas a couple of years ago). Taubin’s frustration is with the dominance of it as an almost but not quite film movement, led by the usual white male directors which (she argues) pushes out voices such as So Yong Kim’s. (Film Comment November 2007. And for Taubin’s comprehensive review of the film: http://artforum.com/film/id=22572). It’s interesting looking at the release dates for both Kim’s films- very limited releases, although better for Treeless Mountain. This only reached 4 theatres in the US – the list of festival appearances for both films reminds you how vital these are becoming as outlets for distribution for art cinema – along with cable networks – where traditional theatres can no longer appear to accommodate.